Every week we pull together some great Canadian recipes from Canadian food bloggers around the web featuring one main ingredient or dish. In this special, mid-week roundup, we have 12 super creative Stanley Cup playoff snacks to help you get your game on! The beginning of the end needs to be properly celebrated. So if you're hosting a few get-togethers to watch the Stanley Cup playoffs, you better treat your guests right. When it comes to party snacks, expectations may not be extremely high, particularly when the focus of attention is who will get the oldest existing trophy to be awarded to a professional sports franchise. However, we all know how cool it is to get a few "OMGs" and "yums" when we present our friends, family and the occasional new addition with unexpected, delicious finger food. The whole game-night experience gets a lot better! So, how about surprising people this year with a pizza cake or a samosa roll-up? Some zucchini chips or buttermilk ranch onion rings, maybe? Or is it loaded baked potato bites what you're craving for? And do NOT forget the dips! We've got your back, here! Check out the gallery below and get recipes for these and other amazing snacks that FBC members put together in time for the Stanley Cup Playoffs. These [Paprika and Cumin-Flavoured Baked Plantain Chips](http://www.cookingsutra.com/paprika-and-cumin-flavoured-baked-plantain-chips/) are comfort food at its best. Plus, they are healthier than the fried version and super easy to make. From **Cooking Sutra**. 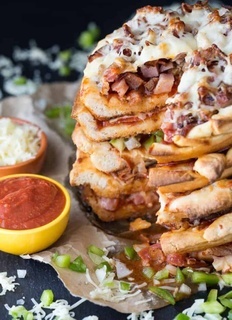 [Pizza Cake](https://www.simplystacie.net/2016/09/pizza-cake/) is a showstopper. If you’re ready to get your “Game On,” this is the recipe for you. It may look crazy huge and elaborate, but it’s actually quite easy to make. From **Simply Stacie**. The grilled garlic bread slathered with creamy ricotta and piled with sweet and juicy oven-roasted tomatoes makes this [Roasted Cherry Tomato Ricotta Bruschetta](https://marisasitaliankitchen.com/roasted-cherry-tomato-ricotta-bruschetta/) a delicious appetizer brought directly from Italian heaven. From **Marisa's Italian Kitchen**. These [Spicy Sweet Potato Toast Tacos](http://girllivinglife.com/sweet-potato-toast-taco/) are healthy, gluten-free, Paleo and Whole-30-friendly appetizers that everyone can enjoy. From **Girl Living Life**. These [Loaded Baked Potato Bites](https://www.ourhappymess.com/loaded-baked-potato-bites/) are a super easy party appetizer that people of all ages will love. Twenty minutes in the oven and they’re ready to be topped with a classic combination of cheese, bacon, sour cream and green onions. From **Our Happy Mess**. [Caesar Asparagus Artichoke Dip with Grilled Crostini](https://www.sugarlovespices.com/caesar-asparagus-artichoke-dip-grilled-crostini/) combines charred seasoned asparagus and steamed artichoke hearts, with a fresh creamy Caesar dressing. The incredible flavour of the garlic and Parmesan of the dressing provides a solid foundation for all the flavours to mingle. From **Sugar Love Spices**. Move over pizza rolls ups, here comes the NEW favorite appie on the block. [Samosa Roll-Ups](http://joandsue.blogspot.ca/2017/06/samosa-roll-ups.html)! This delicious Indian-inspired treat is super easy to whip up and works as a lunch or as an appetizer. From **Jo and Sue**. Amp up your pickle game with this amazing [Pickle Poppers](http://prairieliving.ca/pickle-poppers/) recipe. It’s pretty easy to prepare and makes a fantastic game day or family gathering appetizer. From **Prairie Living**. [Buttermilk Ranch Onion Rings](http://www.compelledtocook.com/project/buttermilk-ranch-onion-rings/) are made with fresh onions and are super crunchy and addictive. The delicious buttermilk batter is made with fresh herbs, onion and garlic powder so there’s no dipping sauce required. From **Compelled to Cook**. Looking for a clean and green dip for your game-night party? This [Cilantro Jalapeño Edamame Hummus](https://www.crumbtopbaking.com/cilantro-jalapeno-edamame-hummus/) has everything you need! From **Crumb Top Baking**. These [Savoury Croissant Buns](http://mamasecretrecipes.com/croissant-buns-with-harissa-olive-filling/) incorporate a tuna harissa and green olive filling. Your guests won't be able to stop with just one bite. From **Mama's Secret Recipes**. These [Zucchini Chips](https://www.friendlypantry.com/blog/32-zucchini-chips) are yummy and healthy. It's a great way to get some allergy-friendly healthiness into your game party. From **Friendly Pantry**. A big thank you to all our FBC Members who participated in Stanley Cup Playoff Snacks Roundup. These snacks look amazing!! Thanks for including me in this delicious list! I’m so glad playoff season is 2 months long! Lots of time to try all these delicious snacks! Thanks for including my hummus in the roundup!